Every rilli quilt has a story. 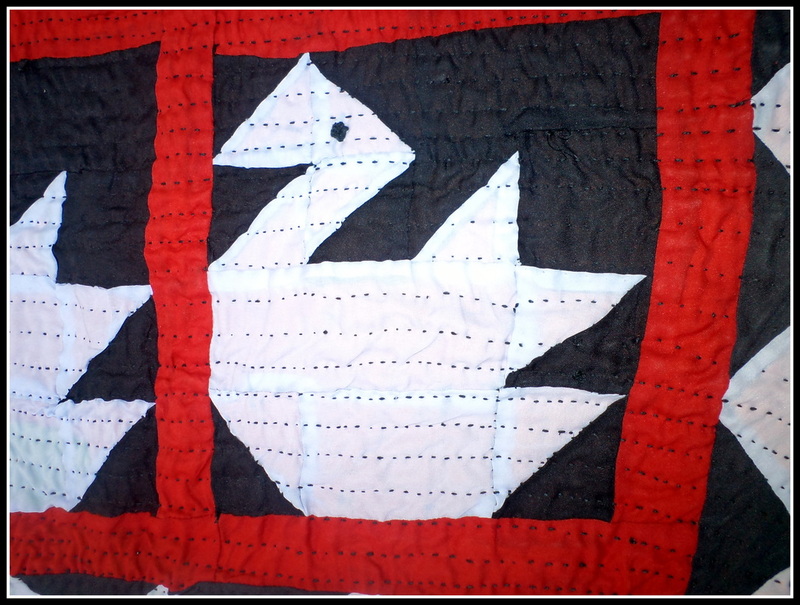 Each quilt illustrates the strength of tradition. Every rilli tells of natural creativity and love of color and design by the women who create them. Examining a rilli gives clues to the life and community of the woman who made it. A specific old shawl as the back fabric indicates she was from an agricultural group, certain colors identify a specific community and new cloth, sequins, beads and tassels indicate a rilli made for an important occasion such as a wedding. For those not from the culture of rilli makers, rillis are a way to help us understand more of their lives, thoughts and creativity. In addition to creating beautiful designs with colors and shapes, they have developed a textile craft with universal appeal touching the senses of those far beyond their community and culture. Rilli quilts are a visual feast of color, pattern and energy. Rillis are made extensively in Pakistan in Sindh, Baluchistan, southern Punjab and in the Indian states of Rajasthan and Gujarat bordering Sindh. 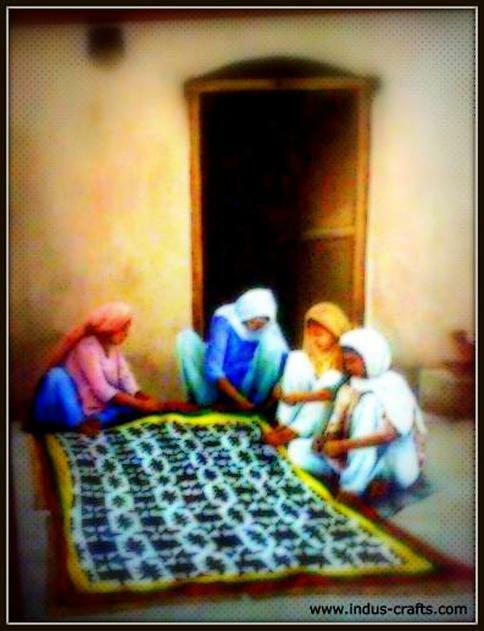 The quilts are called "rilli" (or ralli, rilly, rallee and rehli) derived from the local word ralanna meaning to mix or connect. 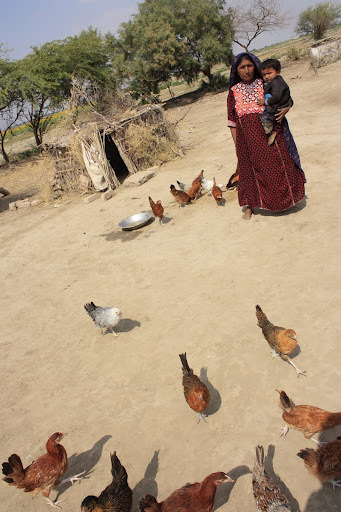 Rillis are made by women of rural villages, nomadic tribes and settled towns. These areas are filled with hundreds of different groups and castes differentiated by religion, mainly Muslim and Hindu, and occupation. The occupations include farmers, herders, various craftsmen, businessmen and landowners. Rillis are made from scraps of cotton fabric hand dyed to the desired color. A typical rilli is about seven by four or five feet. Much of the fabric comes from old, worn shalwar kameez (traditional loose shirt and pant outfits). The most common colors in rillis are white, black, red, yellow, orange, green, dark blue and purple. However, there are some unique regional and tribal color palettes. For the bottoms of the rillis, the women often use old pieces of tie-dye, ajrak (red and blue block printed material) or other shawl fabric. An old head shawl will usually be large enough for the back of the quilt minus about six inches on top and side that need piecing. Rilli quilts have three to five layers of worn fabric or cotton fibers between the top and bottom layers. The filling is basted to the backing using long stitches that are later removed. Usually the piecing on the top is done by one woman. She calls on female family and friends to help with stitching the quilt together when she is ready. This is a time of talking, news sharing and singing for the women. To sew all three layers together, usually several women sit on opposite sides of the quilt placed on a reed mat on the ground. No quilting frame is used. The layers are sewed together by thick colored thread stitched in straight, parallel lines. Depending on the thickness of the quilt and the skill of the quilters, the stitches may be as close as 1/8 inch apart. 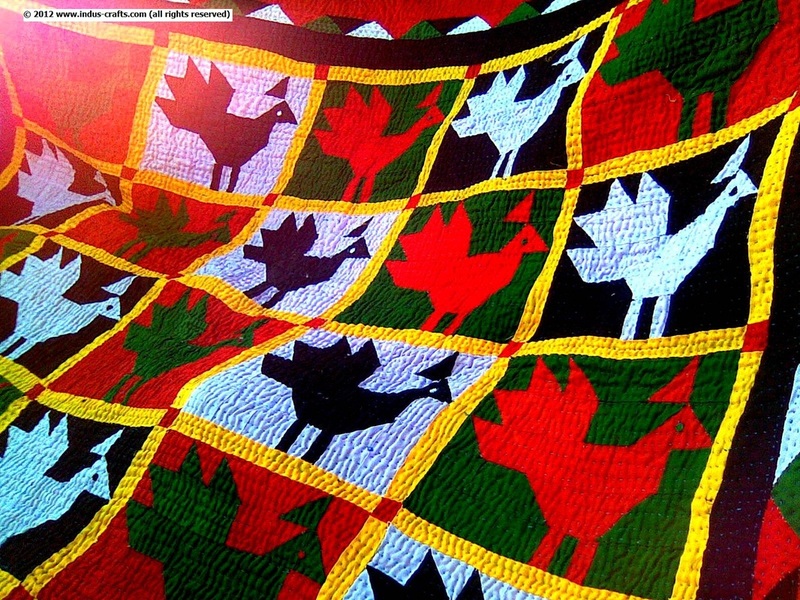 The three basic styles of rillis are: 1) patchwork made from pieces of cloth torn into squares and triangles and then stitched together, 2) appliqué made from intricate, cut out patterns in a variety of shapes and 3) embroidered quilts where the embroidery stitches form patterns on solid colored fabric. A distinguishing feature of rilli patterning in patchwork and appliqué quilts is the diagonal placement of similar blocks. Special rillis made for weddings or gifts often have a variety of embellishments including mirrors, tassels, shells and embroidery. There is much individual expression and spontaneity in color within the traditional patterns resulting in a seemingly endless variety in rillis. 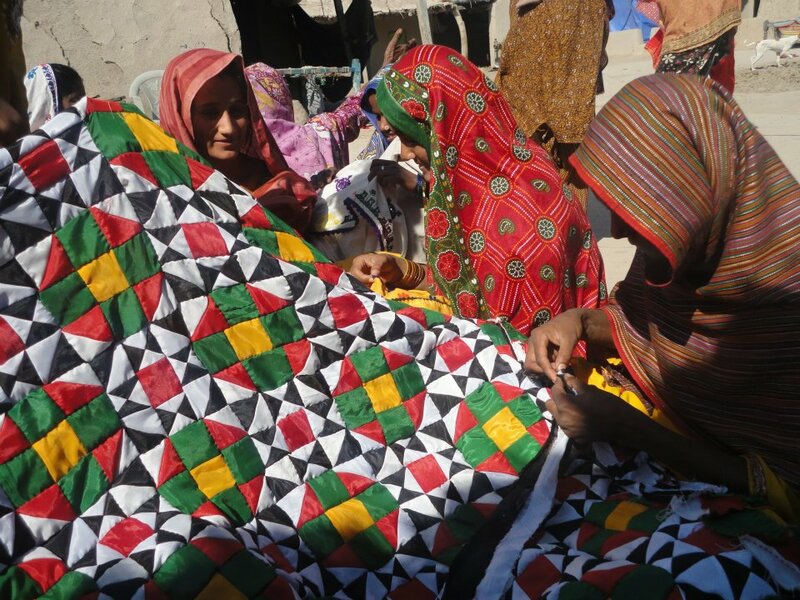 Resource: Ideas from Ralli Quilts: Traditional Textiles from Pakistan and India by Patricia Ormsby Stoddard, 2003, Introduction.